All pro-brewers will tell you that each recipe should have its own water profile, each construction of malt, hops and yeast needs its profile fine-tuned to be perfect. This is seriously hard to get your head around in the beginning, I do understand, but ,similarly, you need to realize that while I am going to be giving water profiles for many styles, they may never be optimal for your particular recipe, so keep playing with it until you get it right – it takes on average 2 or 3 brews of the same recipe with different profiles to get it right in a commercial setup where we know our stuff – home brewers may take longer, but don’t get disheartened. The plus side is that you will get your beers to the level where they don’t taste like homebrew anymore and will taste like commercial examples of the style – this is the final frontier after you have mastered the rest, including yeast control. You will most likely be shocked at the quality of even your first attempts. One last note would be that this is a beginner guide to brewing water, I have left out much information, but it is by design… I don’t want newbie’s to get put off and I don’t want to get stuck writing a thesis either. What is the Importance of Brewing Water Anyway? Say you have a beautiful painting of a ship on the sea, lots of beautiful blue hues, brown and beige from the ship and oranges and pinks from the sunset in the sky. Pretty with all its masterful brushstrokes and swirl techniques…this is your beer’s flavor in all its perfection, with all the right highlights and hues and a perfect arrangement of water chemistry. Now, you take a pair of those John Lennon-type round glasses with bright red lenses and – for dramatic effect – you take a stick of butter and rub them on the lenses. Now you put these on and you look at the aforementioned painting. All the colors are wrong, the artwork distorted and bent beyond recognition and you actually can’t make out what it originally was. The muddy lenses won’t allow you to see the beauty for what it actually is. This is the same beer recipe with the wrong water chemistry – and yes the results are just as dramatic between the two. Don’t believe me? Take an imperial stout water recipe and try to brew a pilsner with it – you’ll end up drinking a pale beer with the mineral profile of a granite quarry. What are you doing? When you balance your water chemistry vs your recipe, you are performing a similar function of a sound engineer at a sound board. The sound engineer shifts the hundreds of keys, ensuring each note is either amplified or muted so that the overall composition is a marvelous piece of art – the difference between a platinum selling artist and your pot-head buddy in his garage! This is the bit about the different elements in brewing water – I’m going to keep this as simple as absolutely possible. Calcium – 50 to 200ppm (Added generally through Gypsum or Calcium chloride). This is the most important item on the list. This element is responsible for actually lowering mash pH in the first place. It’s also crucial for yeast health and a clear beer. The higher the amount, the more easily the yeast flocculates. It is also essential for enzymatic processes in the mash. Magnesium – 0 to 30ppm (Added through Magnesium Sulphate). This is another element that is one of the primary contributors to lowering mash pH, although not as well as calcium. It is also a yeast nutrient. The minimum amount is zero in the mash water because all barley wort contains loads of this stuff, but I can tell you from experience that adding even a small amount of magnesium (in the form of Epsom salts or MgSO4) to your mash does great things for the flavor of your beer. Sulphate – 50 to 400ppm (Added through Gypsum or Magnesium Sulphate). The first major flavor component, many brewing software types will tell you this increases “bitter” in a beer, but it’s a little more complicated than that. It’s a combination of either sharpness, bitterness or dryness in the flavor perception, as well as increasing the hop character in beers. The only time I would go over the 250ppm limit is if I’m looking to do a “to style” Dortmund export or something similar. You’d be forgiven for thinking an IPA needs more, but it doesn’t, as it is one of the contributing factors to an IPA’s bitterness sticking to your tongue. Most award winning IPA’s have a flash of skull-rattling bitterness and a clean hoppy finish that encourages you to drink more = less than 200ppm. If it lingers on the tongue too long, you’ll lose on drinkability. Another point to ponder, is that despite it saying that the minimum requirement is 50ppm, I forget it altogether if I’m brewing continental pilsners and other similar lagers, due to the fragile flavor profile of those beer styles and the hops implemented. Chloride – 0 to 200ppm (Added through Calcium Chloride or Salt). This is the other major flavor component – it provides a fuller, rounder or sweeter perception to the beer, and is used to either increase malt flavor perception or to temper the effects or sulphates (known as the sulphate to chloride ratio, which we will discuss shortly). 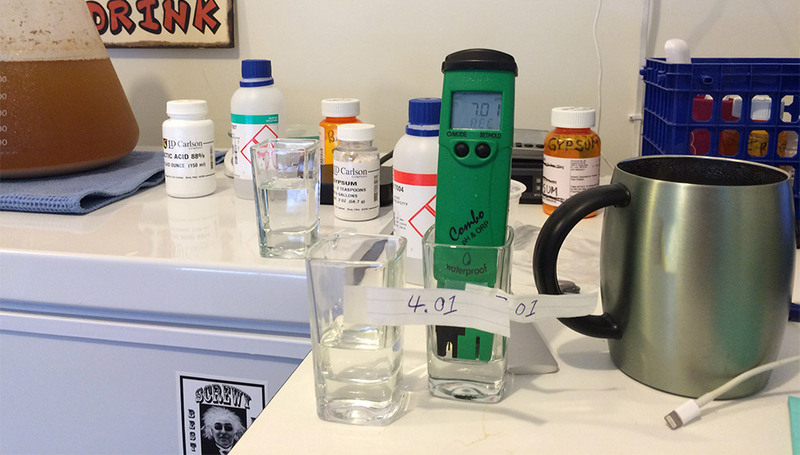 There are brewers who take the levels of chlorides up to 300ppm or more, but I would not for various well-informed reasons, so I recommend you don’t either. It’s a very important element for malt forward beer styles. Sodium – 0 to 150ppm (Added through Salt or Bicarbonate of Soda) Sodium, sodium, sodium – what to do with you? Sodium is an element that is sometimes unavoidable when correcting water chemistry and can lend a sweet quality to certain beers, but can become salty when you approach or exceed 150ppm. It does lend a certain well rounded character to pale beers as well, but much better to keep the concentrations lower than 100ppm unless you are absolutely sure of what you’re doing. Bicarbonate – 0 to 250ppm (Added through Bicarbonate of Soda, usually) This is the primary ingredient that stands between your stout being wonderfully chocolatey and rich and a one-dimensional cold espresso disappointment. When you need an alkalinity buffer, this is your go-to addition. It does make hops overly bitter in a harsh sort of way, so avoid it completely in highly hopped beers as well as pale beers (it can taste harsh on its own too in beers below 7 SRM). 1. Stick to the amount of calcium in the recipes / formulas given for now. 2. BUY A (%#!@!) PH METER!! !…and measure your mash pH 10 minutes after doughing in. ONLY add acid if absolutely required. 3. When it comes to using acid, try using orthophosphoric acid if you can get hold of it. Lactic acid if you can’t. 4. Buy another pH meter – you can’t work without these things. PRO TIP: Only pale and amber beers benefit from a pH of 5.2 to 5.4. To get your brown ales and stouts to have that rich flavor, aim for a mash pH of around 5.6 to 5.8. Along with residual sugars, it’ll help the final beer pH finish higher, softening that roast element into something luxurious and wonderful. I have opted to use the 2008 BJCP guidelines, as they are more familiar to most than the new 2015 version. Coupled with that, Jamil Zainasheff’s book “20 Classic Styles” can be used along with the following guidelines. If you brew it and it doesn’t come out the way he describes in the book, the water chemistry is wrong and you should try again. Also, dodging the subject of alkalinity and residual alkalinity like a plague, I have expressed alkalinity as a value of bicarbonates, easily added to soft or RO water through the addition of sodium bicarbonate (baking soda). If you have water that exceeds this amount for the style you are trying to make, ditch it for a few bottles of RO or distilled water and either dilute or build from scratch. This will however bring up the subject of sodium – if so and in doubt, just try to aim for a sodium level below 100ppm unless stated otherwise. • I am assuming you are using software to calculate your water – no one in their right mind would start off trying to manually calculate water chemistry. For this simplified version, I have opted to use BeerSmith 2 water profile calculator. • Due to the low volume of the water homebrewers use and the fact that brewing water chemistry generally uses the same sorts of compounds, you are going to be scraping around so many small amounts of powders, it would make even the most hardened cocaine addict squirm. If you are struggling with getting the measurements right, increase the volume of water you are treating to make it both easier and more accurate – it is far easier to treat 50 gallons of water than it is to treat 5. • Always look at the ABV and color range of your intended brew, if it’s on the higher side of the style, aim for the higher mineral content specified below, if it’s lower, aim lower. • On many forums I have seen people arguing over the amount of residual minerals actually going into the beer and enhancing the flavor, due to boil off, mash absorption, etc, etc. Scenario #1: I Want to Brew an American IPA, and I Want to Use Reverse Osmosis Water. So I want to make a beer with, say, 70 IBU’s of bitterness, about 6 to 7% abv and the color is roughly amber. The alcohol content, firstly, and the color, secondly, ensure that I can aim for the high side of the IPA spectrum. This water profile makes sure all bases are covered for an American IPA. So you have water that’s not ideal for a Munich Helles…what now? Let’s have a look. Remember that everyone’s tap water is different, so you will need to add your own numbers for your tap water. This water will complement a Munich Helles quite nicely – the little bit of sodium still in the water will barely be noticeable, if anything will give it just a hint of sweetness. You’re sitting with water that’s more suited to a strong stout than anything else. Step 3: Continue as in first example. 16E. Belgian Specialty Ale: No recommendation as it is too varied. Look at your recipe, note the colour and alcohol level and pair it to a beer you think is the most similar – then use that beer’s water profile. *Minerals don’t have a huge impact on sour beers, due to all the bugs we add in there. Your concentration should be on enough calcium to get your mash Ph down and that’s about it. If you are still not sure, generally aim for the lower end of the spectrums provided. Previous Post A Trip to Castle Maltings, Belgium.